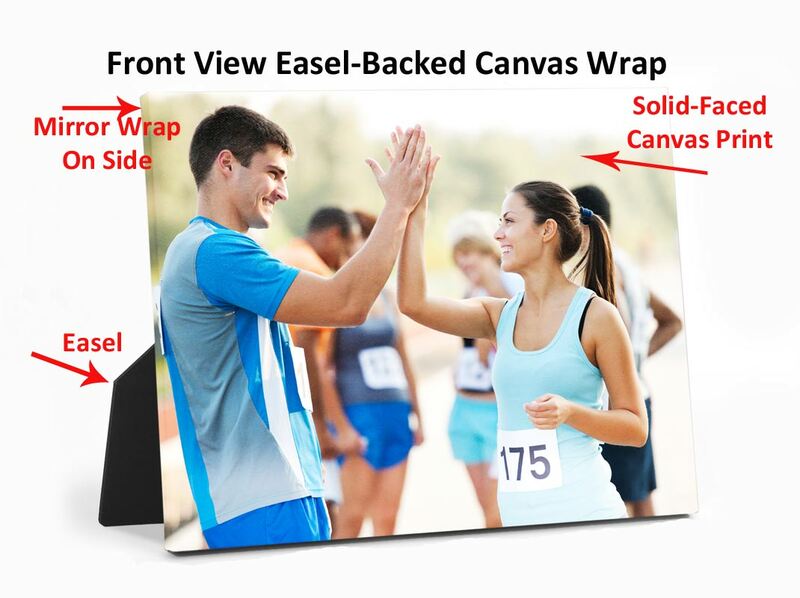 Easel-back canvas wrap prints are a miniature version of our gallery wrap canvas products. The main difference between the easel-back wrap and the standard gallery wrap is the size. These small canvas wraps are designed to be used as “tabletop” art. They come with an easel on the back to permit their use on a tabletop or countertop. The easel-back canvas wrap is made from the same artist-grade canvas as our other canvas wrap products. The exceptions being, they have their own stand, permitting them to stand on their own, and the side wrap is a little smaller. Easel-back canvas wraps offer the same professional quality as our solid-faced canvas wrap, in a fun-sized, affordable package. They’re specially mounted on high-density wood fiberboard with super-tight corners, so they won’t warp or sag. You can literally push on the front and it won’t give – same as the larger wraps. 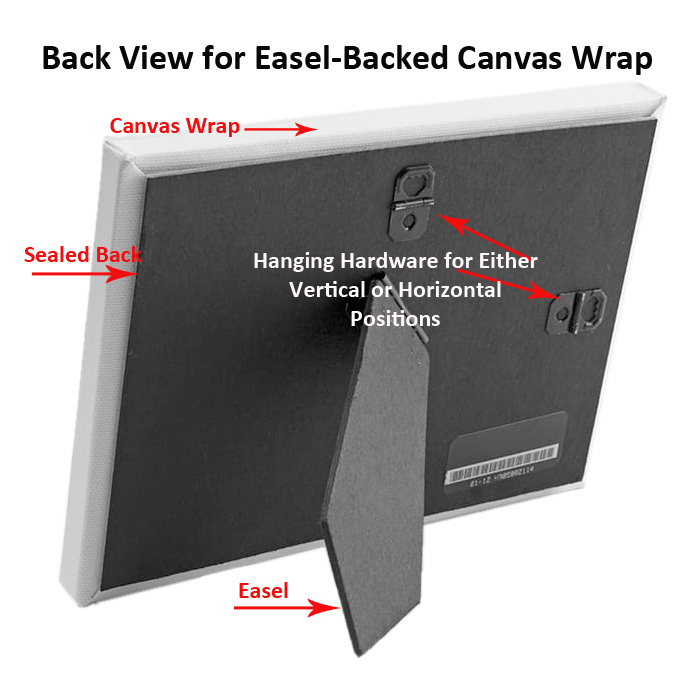 Easel-back canvas wraps offer two convenient display options with pre-installed hanging hardware and an easel leg. This permits you to showcase them in both portrait and landscape orientation. This makes them perfect for placement on a desk or mantle. These artist-grade miniature canvas wraps are durable. They feature image clarity and color accuracy. The quality is kept high because images are printed on the high quality canvas using only archival inks. This provides the added benefit of preserving as much fine detail as possible, with no over-saturation or color shifting. The canvas is certified artist grade material. It is also OBA-free to ensure quality and accuracy - all at a price that can’t be beat. The easel-back canvas wraps come in 4 sizes: 5” x 7”, 6” x 6”, 8” x 10” and 11” x 14”. All four sizes make great gifts. Photograph a special moment in time and turn it into tabletop art! Begin today to experience this great product. Typical turnaround time is about 2 weeks, or less. If you would like to visit our shop and see one on display, we welcome the opportunity demonstrate its quality and characteristics. We are located at 10070 Ford Avenue, Richmond Hill, GA 31324. If you have questions and prefer to call, contact us at 912-756-2781.